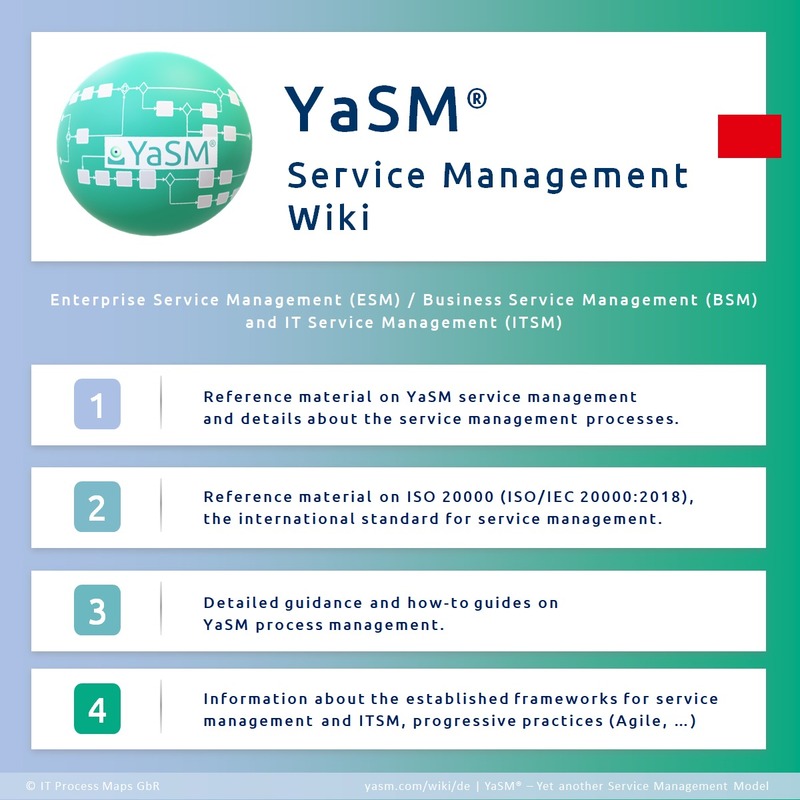 YaSM® Wiki - the Service Management Wiki: Wiki about YaSM®, enterprise service management, IT service management (ITSM) and ISO 20000. Service management doesn't need to be complex and difficult: All established frameworks and standards such as ITIL®, ISO 20000, COBIT®, CMMI-SVC®, SIAM® or VeriSM™ follow a few basic principles. Our clear-cut YaSM model helps you with understanding and applying these principles. YaSM® ('Yet another Service Management Model') is a translation of service management best practice into a streamlined, accessible set of processes and ready-to-use templates. It's a good match for the leaner, more flexible operating models favored by today's service provider organizations. 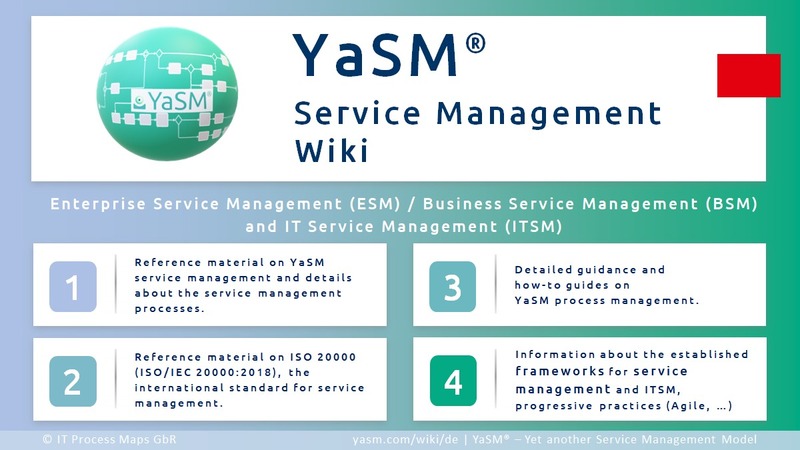 YaSM is not another framework but follows the established frameworks for service management and ITSM, and it conforms to the requirements of ISO 20000, the international standard for service management. There are two YaSM products: The YaSM Process Map, a complete process model for service management, and the YaSM - ISO 20000 Bridge, an additional component for organizations that wish to become certified to ISO 20000. What is YaSM? Introduction to YaSM service management on a single page. Watch the video with Stefan Kempter introducing the YaSM model. Another good starting point is our video series about the "simple principles of good service management", where we explain what it takes to be successful as a provider of services. If you have any questions or want to share your thoughts, please head over to the YaSM community! This wiki is run and sponsored by IT Process Maps, creators of YaSM and the YaSM Process Map, and authors of the popular IT Process Wiki. 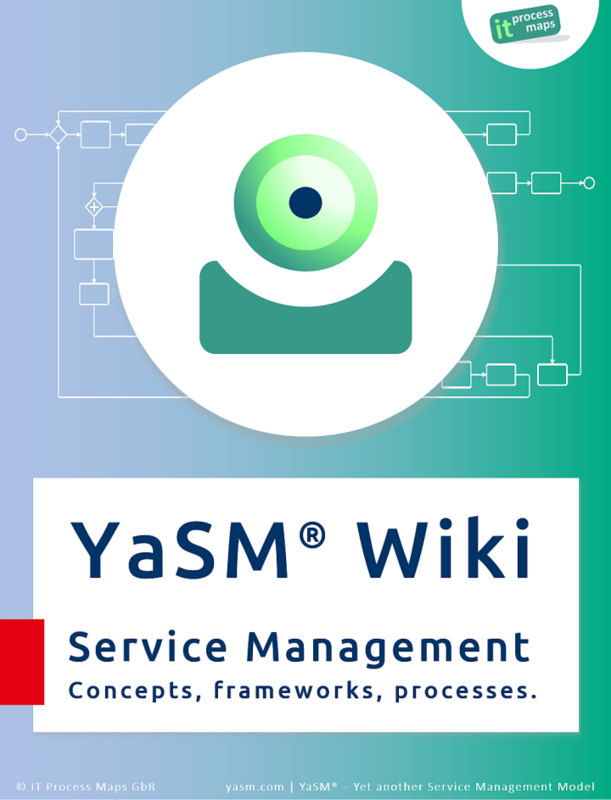 The YaSM model and the Service Management Wiki were established in 2014; the wiki is available in English and German. What is ... ITIL® / ISO 20000 / SIAM® / VeriSM™? YaSM stands for "Yet another Service Management Model". YaSM was developed as a streamlined service management model and it is meant to stay that way. Users of YaSM are free to adapt the model to the specific needs of their organizations, for example by implementing only part of the model or by adding more sophistication where required. The contents of the YaSM Wiki are and will always be available for free. You may use and share those contents provided you give appropriate credit (see the full Creative Commons license). Please head over to the YaSM support portal and join the discussions in the YaSM community. Check out the YaSM knowledgebase! Hi! I'm Stefan Kempter and in my articles I write about YaSM, service management, process templates and the YaSM Wiki. I hope you enjoy your visit to our web site! Popular posts: YaSM - an alternative to ITIL®? | Launch of the free YaSM Wiki, 2014. Best practices for service providers in the areas of enterprise service management (ESM) / business service management (BSM) and IT service management (ITSM). Reference material on YaSM service management and details about the service management processes. Reference material on ISO 20000 (ISO/IEC 20000:2018), the international standard for service management. Detailed guidance and how-to guides on YaSM process management. Reference material on ITIL (ITIL 4, ITIL V3), de-facto standard for IT service management (ITSM). ITIL® and IT Infrastructure Library® are registered trademarks of AXELOS Limited. SIAM® is a registered trade mark of EXIN. VeriSM™ is a registered trademarks of IFDC.